This post sharing the benefits of PB 8 Probiotics is sponsored by PB 8 Probiotics and Mambo Sprouts. Bacteria. It doesn’t sound like a good word. Like, yuck, bacteria. If you had bacteria on your hand you would want to wipe it off. Fast. Without betraying your cool exterior (name that X-Files episode). But not all bacteria is bad, in fact, some of it is good. I’m going to tell you all about this good bacteria as I share with you the benefits of PB 8 Probiotics. In its natural state, your body produces good bacteria. This good bacteria resides in your gut and helps keep your body running well. If you maintain a good diet, your gut bacteria has a better chance of existing in a state of happiness, helping your body systems work efficiently and keep you healthy. And the real world has donuts. And ice cream. And bad bacteria. Improving your diet would be a great start, but it’s not always enough. There are so many potential other causes that even the perfect diet may not create a healthy balance of good bacteria, which is why there are probiotic supplements like PB 8 Probiotics . Nutrition Now Pb 8 Pro-biotic Acidophilus for Life — 120 Capsules X 2 The benefits of PB 8 Probiotics are numerous, but with one goal in mind – to support digestive health with good bacteria*. PB 8 Probiotics don’t contain milk, gluten or soy and their bottles are BPA-free. Their probiotics contain 8 strains of beneficial bacteria including Lactobacillus & Bifidobacterium species of probiotics*. At the time of manufacture, PB 8 Probiotics contain 14 billion CFUs (per serving). PB8 Probiotics can help support your digestive health which in turn can help improve the way you feel and the way your body responds to the things that aren’t ideal like indulging in that donut or during times of high stress. 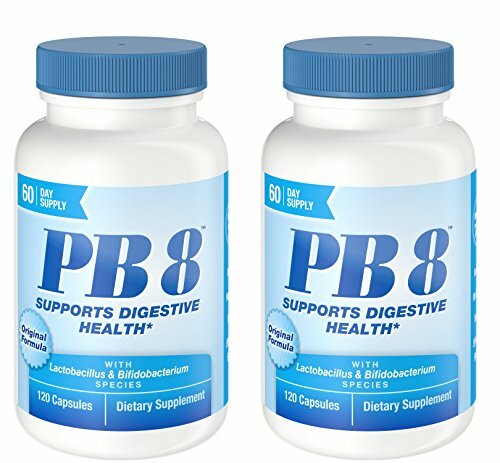 PB 8 provides the beneficial bacteria you need to support a healthy digestive system*. For more information about PB 8 Probiotics, and to snag a $1 off coupon visit: PB 8 Vegetarian Probiotic Supplement. PB 8 is available at health food stores, Amazon.com and you can also purchase it at Vitacost.com as well. I eat “terrible for you” cheap food. Probiotics have been an absolute Lifesaver for me!! They have made all the difference in my digestive system!! 15 years of suffering and I finally have some relief after discovering them!! I’ve been reading so much lately about gut health. I haven’t been eating very healthy lately & am beginning to believe that is why I have been feeling so sluggish recently. I think Probiotics would benefit my overall health and get me back to my normal healthy eating habit regime. Thank you for the giveaway chance. I know I eat too much junk food and have wanted to try using probiotics. I like to eat salty foods, I really need to cut back on that. I drink too much soda. I’ve tried quitting or even cutting back a lot of times, but no luck yet. Eating too much junk food. My doctors say that I need to take probiotics since I take so many antibiotics. It requested that I leave my mailing address but there wasn’t a spot to. I will gladly submit my mailing address. I’ve been wanting to try these probiotics! I take a probiotic daily…I feel so much better when I do. UGH I like Monster energy drinks too much! I need to quit!